Ado-Ekiti- The Federal High Court sitting in Ado-Ekiti on Monday, failed to order the unfreezing of two accounts belonging and operated by Governor Ayodele Fayose of Ekiti State with Zenith Bank, adjourning hearing in the case involving the governor and the Economic and Financial Crimes Commission, EFCC till September 30, 2016. File: Ekiti state Governor Mr Ayodele Fayose.File: Ekiti State Governor, Mr Ayodele Fayose. Justice Taiwo Taiwo adjourned the case till September 30 on the request of Fayose’s counsel, Chief Mike Ozekhome (SAN), who sought for adjournment to be able to respond to issues raised by the EFCC in its reply to a motion on notice dated 23rd June, 2016 wherein the applicant sought an order lifting the restriction placed on Fayose’s accounts with Zenith bank . Oyedepo argued further that the EFCC had on the 29th of June received an order of the court directing the commission to appear and show cause why a mandatory order being craved by Fayose should not be granted to unfreeze the two accounts already restricted with the bank. 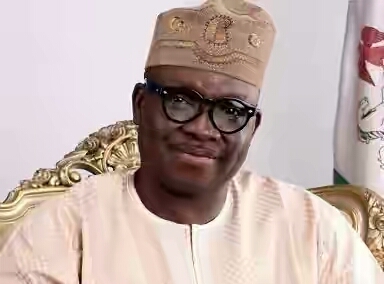 Fayose had in an ex parte motion deposed to by Bimpe Olatemiju prayed the court to grant a mandatory order lifting the ban placed on the said accounts, describing the EFCC’s action as an infraction and brazen infringement on absolute immunity conferred on Fayose by Section 308 of the 1999 constitution. While opening his defence at Monday’s proceeding, Oyedepo said : “We received the order of the court on the 29th of June, 2016 at our office in Lagos directing us to appear before your lordship for freezing of the accounts of the applicant in the custody of the 2nd respondent . “My lord, I was served three minutes to the start of today’s hearing . But glancing through this bulky document, virtually all the issues raised were issues we never touched upon. “We don’t want to be caught by the cul de sac of the Supreme Court’s averment that evidence not denied are deemed admitted, because it is a trite law. “It is only reasonable and proper that we have given the opportunity to traverse everything they have raised and argue and with this, they have foisted an adjournment on us”, he said. The Judge, who broke the news of his vacation, which he said will make it difficult for short adjournment , suggested to the parties that the matter could be transferred to a vacation Judge in Abuja and Port Harcourt to handle, if the adjourned date seems afar, which the plaintiff’s lawyer had vehemently rejected. Ozekhome said: “My lord, the vacation Judge may find it difficult to understand the background of the issue. You are aware of everything and we are not in a hurry. We will wait till you come back”, he said.